There is so much I can say (and if you know me I have said it ad nauseum over the last 25 years) about the Loma Prieta Earthquake of 1989. It was my senior year of high school and for whatever reason (and despite two other big quakes I lived through) has had the biggest influence (quake category) on my life. Five years ago I wrote my story about the experience and re-reading it recently it still manages to perfectly caputre what happened that day. When you check out that post from 5 years ago, be sure to look at the links to some of my favorite YouTube videos from that day. New this year is the video below of the aborted beginning of Game 3 and the first part of the actual Game 3 played 10 days later. ESPN’s 30 for 30 recently premiered a new documentary titled “The Day the Series Stopped” which I thought was pretty good. 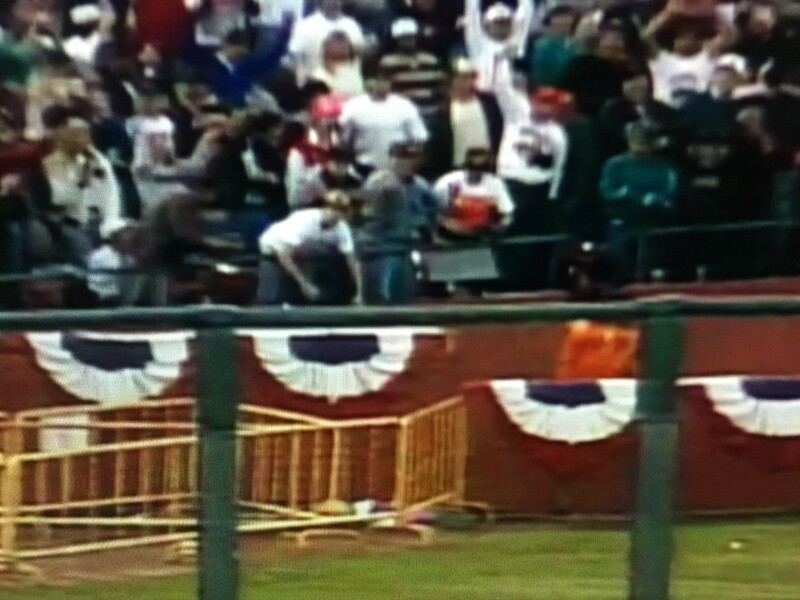 One of the more interesting parts was footage of the completed game 3 including when Matt Williams hit a home run that landed right in front of me in the Left Field stands. I took a screen capture. I unfortunately have no idea what I was wearing that day to the game, but I know I am in this picture! This is part 5 of Earthquake Week at Club Josh for the 25th Anniversary of the Loma Prieta Quake on 10/17/1989. This entry was posted in Earthquakes and Natural Disasters on October 17, 2014 by clubjosh.